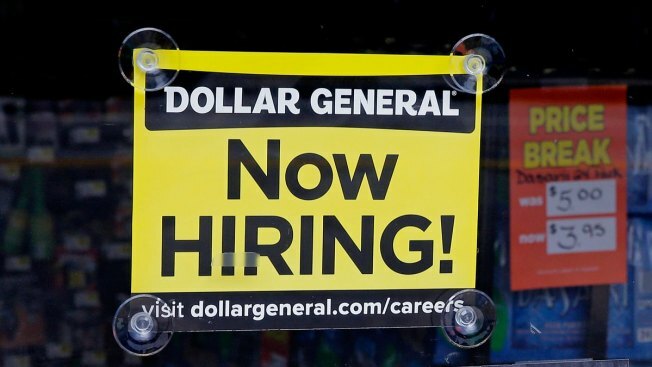 FILE - In this Wednesday, May 18, 2016, file photo, a "Now Hiring" sign hangs in the window of a Dollar General store in Methuen, Mass. On Wednesday, Oct. 12, 2016, the Labor Department reports on job openings and labor turnover for August. U.S. job growth slowed in August as employers added 156,000 jobs, still enough to suggest that most businesses remain confident in an economy now in its ninth year of recovery from the Great Recession. Friday's jobs report comes as Americans have grown more optimistic about the economy. A measure of consumer confidence in August hit its highest level in 16 years, the Conference Board said this week. Even the traumatic damage caused by Harvey around the Houston region is unlikely to break the national economy's stride. Gasoline prices are rising as the flooding from Harvey knocked out refineries and ports, but any possible fallout will likely surface in economic reports over the next two months. Overall, hiring this year has averaged 176,000 a month, roughly in line with 2016's average of 187,000. It was the 83rd straight month of job gains. The August jobs report showed that more/fewer people either have a job or are looking for one. Anyone not actively looking for a job isn't considered part of the labor force and isn't counted as unemployed. This so-called labor force participation rate held at 62.9 percent. The participation rate has tumbled from 66 percent over the past decade, but some of that decline reflects an aging U.S. population that is retiring and lowers the participation rate.